Geheimakte 2: Puritas Cordis | Geometry saves the Earth! 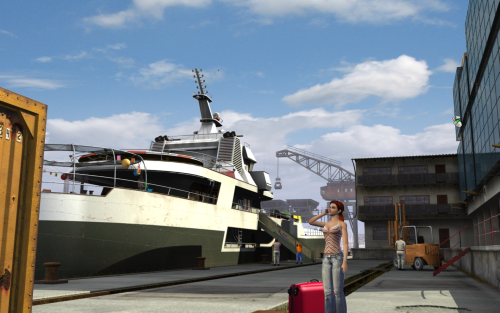 The woman in the picture is Nina Kalenkow, one of the protagonists of Geheimakte 2, about to go on a (of course, not) harmless cruise. She demonstrates one of the minor issues I had with the game: it’s not quite decided where on the border between “serious” and “funny” it stands. The overall story feels a bit “serious”, while the scene-to-scene gameplay is more “funny”. Furthermore, the characters often destroy the fourth wall by mentioning something about this being a computer game. It’s not making it a bad adventure, but I would be happier with it being completely on one side. Besides this issue, I liked it, especially the part which plays in Paris, due to a nice look and feel of the locations and story taking place there. In the very end, there’s a really interesting screen which shows how long you took to finish the game, the number of mouse clicks, and so on, which is a nice idea.